That’s when it’s time to move from plain, old, vanilla, status quo landscape maintenance to fine gardening. Here’s reality: the industry average for our landscapes is status quo care. You plant stuff, help it grow, keep it neat. It may not be exciting, but it works. Think of it this way – as humans we need to eat to stay alive. You can eat the same old things, day after day, to sustain your body. But that’s not living. That’s maintenance. Or, you can choose to stir things up and make eating interesting – try new and even exotic ingredients and dishes to tantalize your taste buds and make eating enjoyable. That’s fine dining. Think of your landscape in the same way. You can work to maintain a status quo, season to season and year to year, or you can choose to work with your landscape and help it evolve as the living entity that it is. Landscapes don’t like to be frozen in time – they prefer to be “life-scapes,” responding to natural biological processes as they grow and mature. Picture your landscape as a life-scape video and watch it grow, bloom, go dormant, and regenerate with the seasons. Whether you realize it or not, your landscape wants to make sense in nature and be organized according to natural laws. It wants to be vibrant and deliver a “Wow!” in the form of blossoms and color that help plants reproduce but also help draw us in with their beauty. Your landscape needs to make sense. Anything that grows and evolves over time won’t make sense if you try to freeze it in time and maintain that status quo. Landscapes are like puppies – you can’t keep them as roly-poly fluff balls forever. You have to nurture and respond to them as they grow and turn into incredible adult-dog companions. It’s important to embrace your landscape as a living, breathing, evolving thing and understand how all the elements in it work in harmony. Having the skill set to know when your landscape is out of whack is crucial. That’s when you need a Fine Gardener to help make sense of it all and ensure both beauty and balance. Gardens should be healthy and vibrant. 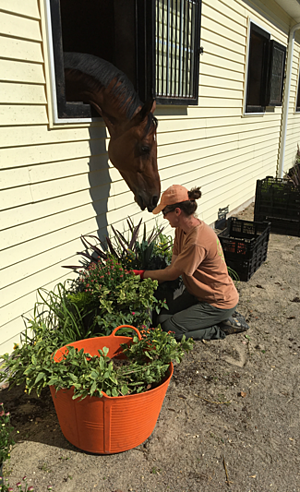 When they are, they’re working in harmony -- plants, soil, and overall environment. A healthy garden is better able to withstand the myriad outside pressures they face from weather, pests, disease and the normal fluctuation of seasons and the landscape. Fine Gardeners are always in assessment mode. Even the horse in the image to the right is keenly interested! Is the color of that flower right? Is the break in that leaf normal? Is the landscape as vibrant as it can be? If the answer is no, a Fine Gardener has the skills to see that and guide the landscape back to vibrancy. The key is to work using the horticultural standards of professional gardening. Put another way, someone used to simply maintaining a landscape looks at it as a single unit – is everything neat and trimmed up? A fine gardening mind looks at individual plants to evaluate their specific condition as well as their collective place in the overall landscape. Is it appropriate, balanced, and contributing to a harmonious “Wow!”? Of course, “Wow!” is transient. A landscape is not in a state of perpetual “Wow!” However, as gardeners, we can control the “Wow!” to a large degree by incorporating décor, seasonal planters, and other attention-getting elements or features, such as a pond or other water feature. The maintenance mind does not have time for that “Wow!” It must go from one property to another quickly, where a Fine Gardener looks for ways to bring “Wow!” to the property. The Fine Gardener will spend more time on a property to understand how it works and and figure out the best ways to implement functionality and “Wow!”. When I started in the landscape business in the late 80’s there was no fine gardening. Back then it was all about landscape maintenance. I was initially hired as the “flower girl” to plant bare root perennials – they weren’t even sold in pots back then. 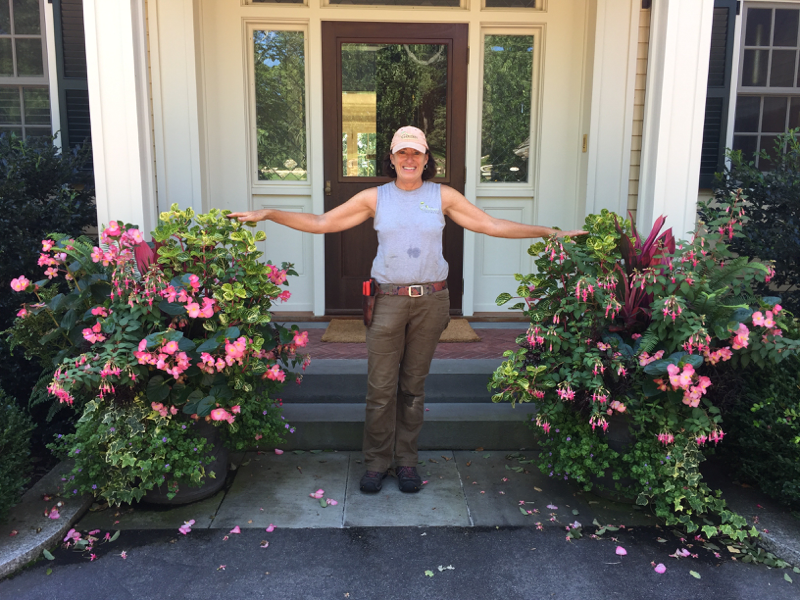 In the 90’s I realized that what I was doing was “finer” than maintenance-type landscaping and soon I was brought in by maintenance-style landscape companies to provide a new level of beauty and harmony to their projects. Anything that grows and evolves over time won’t make sense if you try to freeze it in time and maintain that status quo. Now you see the opportunity to fine garden everywhere, but the maintenance mentality can be tough to overcome. As a Fine Gardener, you have to pay closer attention to your landscape because it is unique – to see all the elements for what they are and how they work together. As a Fine Gardener, you develop the ability and desire to think ahead so you can respond and work with nature rather than react to her. And, Fine Gardeners are also great partners to work with because they will always consider the client in the working equation. So if your landscape has become boring, perhaps it’s because you’ve been in maintenance mode all along. Now’s the time to expand, explore, and embrace natural change and progression as a good thing that can bring added beauty, joy and, yes, excitement to your landscape. It’s time for Fine Gardening! Learn what Fine Gardening is all about by reading our eBook titled, The Fine Gardener's Guide to a Beautiful and Luxurious Landscape!